Contrary to popular belief, all the love tales have not been written. We have put together a bouquet that will help you start your own, in a fun and flirty way. 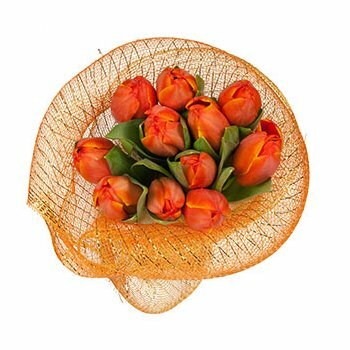 Your recipient will receive 12 non-traditional orange Tulips nestled among Greenery and held together with fun Mesh Wrap. Finally ask her out, send a surprise to the office, or say you're falling for her all over again with Nontraditional Confessions.